ok ive decided on tracks....advice...how many wheels and do i need a motor for every wheel? I 2nd the advice for getting a track kit. Tracks are a lot of work to make on your own. hmm well ive got tracks that are on a robot rc so i might just rip out the insides (its hollow) and whola i got a $20 tank chasi! and with the sonar about how much does the price vary...? with the sonar about how much does the price vary...? but one thing i dont understand is how do i turn it into an obstcal avoider? Well technically you can make your own sonar for like $10 . . . but its a question of how much your time is worth too. I think ~$50 would be a good typical price for decent sonar. have you searched google yet for a tutorial? if it takes you 30 hours to get the sonar working, is it really worth the $15 you save? especially if you can make $10/hr at most summer jobs? yea well with summer jobs im not alloud to work legally im 12...so yea...but just to prtect my circuit i bought some fuses....can i solder them on directly or do i need a holder for them? They are both extremely easy to use! I would get those, and maybe mount them on a servo and have them scan! fuses....can i solder them on directly or do i need a holder for them? The Maxbotics sonar is a good choice - it is easy to interface, reasonable cost, and good performance. I'm using the LV-MaxSonar EZ0 because it has the widest beam, which is good for proximity sensing, but not for mapping. SmAsH, I was researching net for a while for best sonar sensor schematic, and got some useful info (IMO, it is unacceptable for robot-builder hobbyst to buy thing that can be easily made). If You plan to use 1 MCU, it is possible not connect sonar with it avoiding another MCU with I2C. Also it is a wide area for experements. I am planning to make 10$ sonar, but not yet 100% sure about supply solution. If You need info, PM me. yea ive looked around a bit too and i cant realy seem to find anything that really fits my needs...but for something else would it work if i had three high powered leds surrounding the light sensitive cell and the put duct tape around it so only reflected light would get it? If you are looking for CHEAPEST method of abstacle avoiding, You can use TSOP17xx ( for example TSOP1740). It is simple IR reciever for remote-controlled devices (TV, etc. ), and it reacts only on 40 KHz modulated IR siganl (really, bursts of 40 KHz waves). So, if you take a IR LED and TSOP nearly at same dierection, light, reflected from obstacle will affect TSOP and cause sensing ( voltage of one pin changes). It is simpliest and cheapest (~0.5$ TSOP and 0.2$ IR led, 2 resistors and NPN transistor) way to detect something in front of your robot, but it has some drawbacks too ( not all bodies reflect light same way, for example mirror and wood will be sensed on different distance). And you need MCU to control voltage , turn on modulation and make decisions of course. Ive been looking into some ruggedly designed track that will not be too labor intensive. Unfortunately, most of the "track kits" are either way too mickey mouse, or way too expensive. 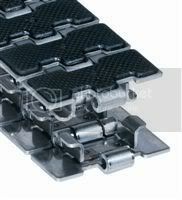 So, after some research I think that using conveyor chain would work great, if I could find the right size / pitch. These look great, but the pitch is kind of big. The smallest diameter sprocket I could use is 4Â½ inches, which isn't going to work well for a "triangle track" configuration. The other drawback is you have to use special conveyor sprockets, which, of course, they want a mint for. do you know where i can buy such a chain and sprocket? MSC Industrial has some that looks promising also, with a smaller pitch, but without the rubber feet. I was so stoked on finding this stuff that I was going to wait until I was done and I could post triumphantly post pics, but hey, everyone here has helped me so much I just couldnt keep the goodies to myself. what pics are you talking about SmAsH? yea its just drying in the laundry..ill post some pics once i test it again. do you have any source code also?